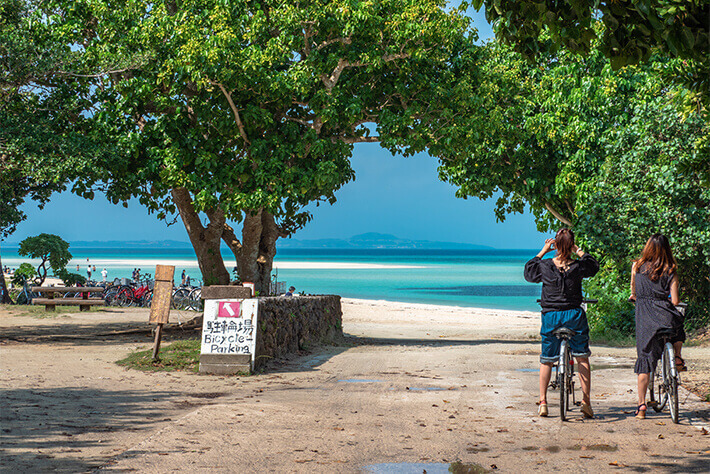 About 15 minutes from the Ishigaki Port Outlying Island Terminal by the regularly scheduled liner, Taketomi Island is also easily accessible from Ishigaki Island. 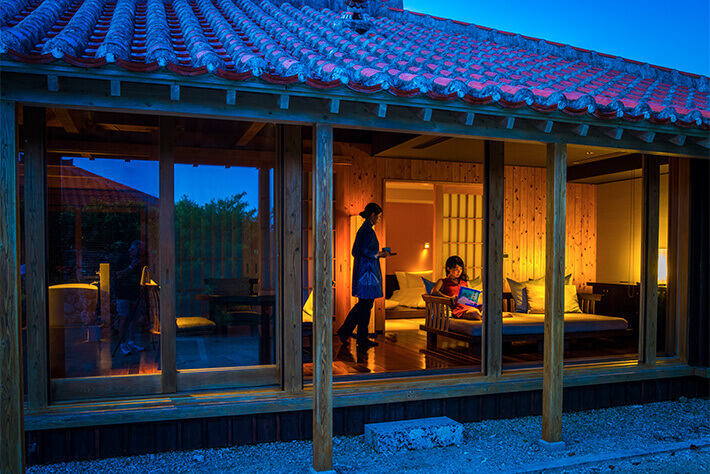 The traditional wood-structure homes featuring red roof tiles, the limestone walls, and the white coral sand paving the streets that form the identity of the village is a landscape that represents Taketomi Island, which has also been designated as an Important Traditional Building Group Conservation Area by the national government. Surrounded by shallow waters and calm waves, Taketomi Island is complete with the typical landscape that most associate with Okinawa. Witness the old-fashioned townscape, the sunset dyeing the sea red, and stars shining in the night sky in silence. 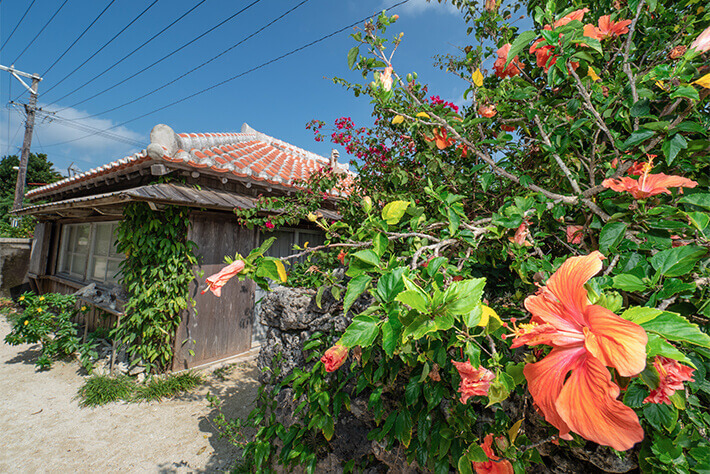 This island, the birthplace of Asatoya Yunta, known widely from Okinawan folk song, is a wonderful island that invites visitors to the flow of eternal time. Limestone walls decorated with hibiscus and bougainvillea, with the roofs fitted with traditional red tiles in the background. 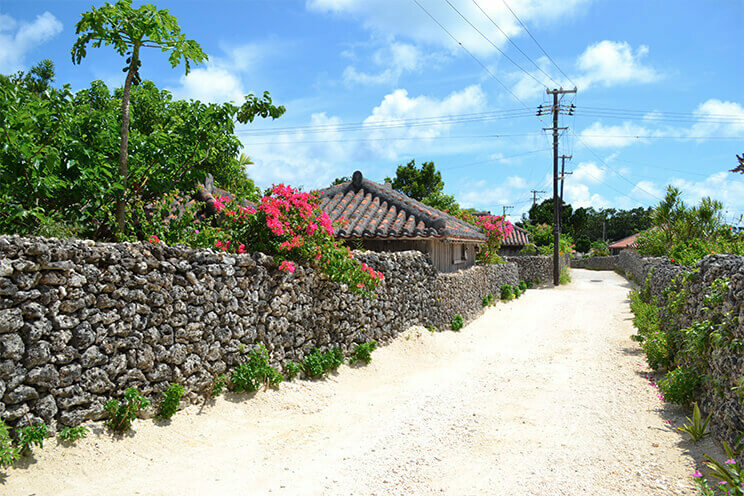 The townscape of Taketomi Island, which maintains a traditional appearance, is designated by the national government as a preservation district for the important traditional buildings. 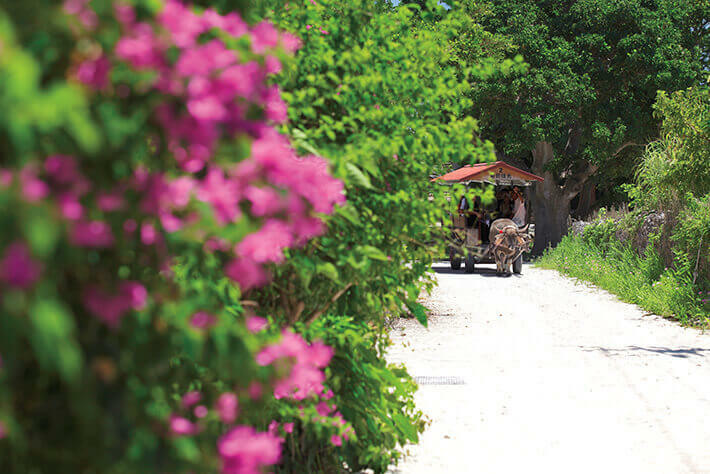 Take a leisurely walk to explore the streets paved with white coral sand or catch a ride on the water buffalo carriage while listening to songs played on the sanshin by an island guide. The flow of time throughout the settlement that has remained unchanged over time will have visitors captivated. The Tanadui Festival (Tanedori or Tanadui) is the largest festival on Taketomi Island, which takes places over 10 days from the 21st to the 31st of the sexagenary cycle on the lunar calendar each year, beginning with the sowing of seeds on purified land and then praying to the gods for healthy growth. It is also designated as an important intangible folk-cultural property by the national government. 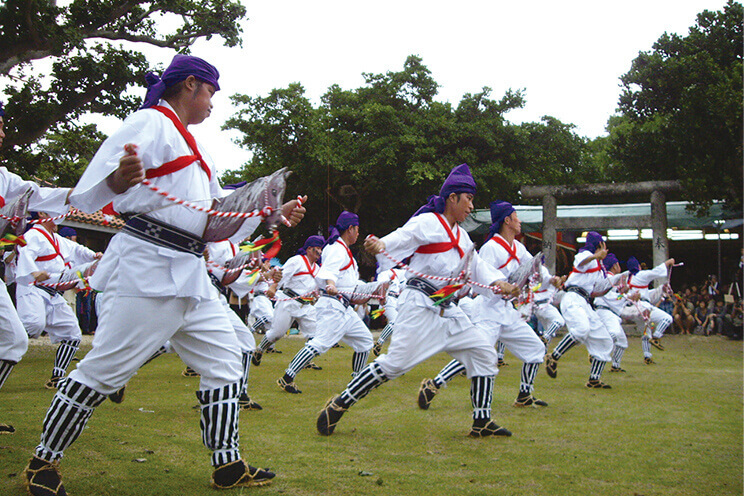 During the 7th and 8th days of the festival, a number of votive entertainment such as dances and plays is showcased, which is also enjoyed by people visiting from outside the island. If your trip happens to fall on the dates of the Seed Festival, please be sure to check out the traditional performing arts of Taketomi Island. On the west side of the island away from the settlement, there is the Nishi Pier, a vantage point of the Yaeyama Islands. 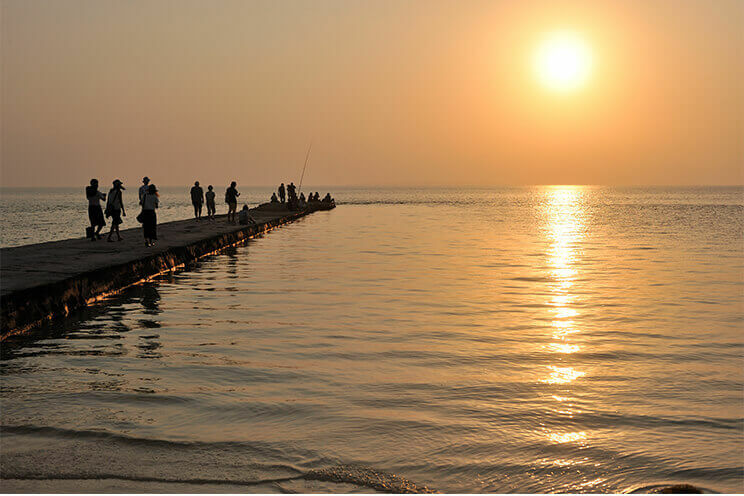 When standing at the tip of a jetty that stretches straight above the sea shimmering in emerald green, you can view as if you are standing on the sea. Additionally, the light streaks reflecting off of the sea as the sun sets on the horizon, turning the blue sea orange, appears as though there is another pier over the sea. When the sun sets, darkness surrounds the area and the starry night sky takes over as if the stars are falling from above. 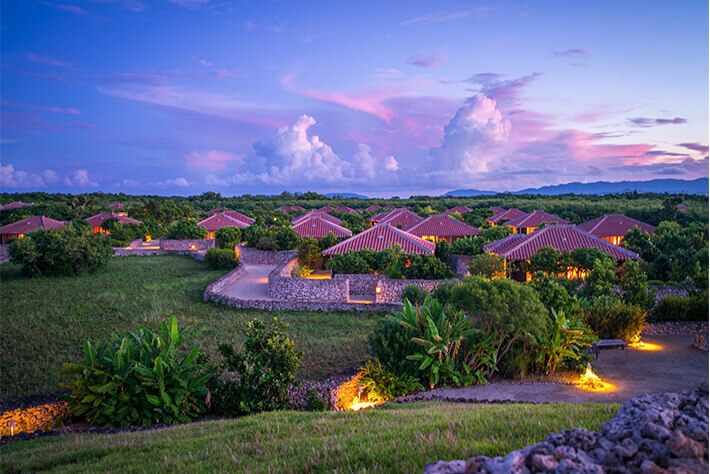 The lights in the village at night bring on a quiet tropical night in contrast with the daytime scenery.